A unique board game developed by a group of students at Western University will help bridge gaps between various health disciplines to better educate students about their roles in interdisciplinary health teams. With the introduction of more than 200 family health teams across Ontario over the last decade, students at Western's Schulich School of Medicine & Dentistry saw a need to bring together students from all health disciplines to learn how to better work together in an interdisciplinary environment. 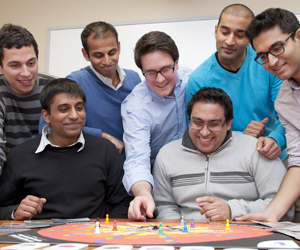 The Schulich students began developing the board game as part of a second year ethics project, and in the two years since it has been professionally reproduced for use in healthcare faculties at universities across the country. It is currently being translated into French, and digital applications for tablet devices are also being explored. "We wanted to develop something creative that could be integrated into the curricula of all undergraduate and graduate healthcare programs, from audiology to personal support work, physiotherapy, occupational therapy, and all the way to the different medical specialties," said Sarit Khimdas, a fourth year medical student at Schulich. Khimdas and his classmates, Akshay Shetty, Chandheeb Rajakumar, Colin Meyer-Macaulay, Cal Shapiro, Rachit Sheshgiri and Neeraj Patel, used a case-based approach to create a game that would provide a realistic look at how different allied health professionals approach various aspects of patient care. The game, called 'Circles of Care,' can be played by four to eight players and ideally would be played by a group of people each from different healthcare programs. "It provides the opportunity to learn together by discussing what our individual roles are in the healthcare team," Khimdas said. Their work was presented at both the national and international interprofessional care conferences and was published in the most recent edition of the Journal of Interprofessional Care.